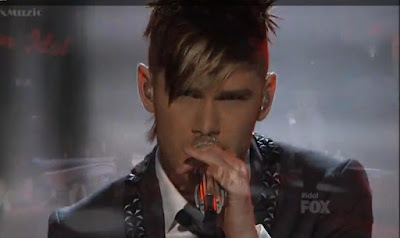 American Idol contestant Colton Dixon sings Stevie Wonder's "Lately". 1. Steven Tyler is lucid! Oh no wait, never mind. At the start of the show, the Aerosmith front man was sitting up straight in his seat and actually offering some constructive critiques to the first couple of contestants. And then it started to slide downhill after that, until we ended up with random, meaningless phrases to contestants who looked utterly baffled. Despite the improvement in Randy's and J-Lo's remarks, and *gasp*, no exclamations of "Inittowinit!!!" you might want to click and see why American Idol still needs Simon Cowell. 2. I loooove Colton Dixon. I was worried at the start of this season, because I remember being so charmed by the quality and character of Colton's voice in Season 10. I was seriously bummed when he got the ax just before the Top 24. When he turned up for Season 11, however, there seemed to be a little something missing in his performances and I was preparing myself for another early exit. Things got off to a rocky start tonight when Colton attempted Stevie Wonder's "Lately" in rehearsals. Then producer Jimmy Iovine asked the Tennesse boy to sing some of his own work, so Jimmy and guest mentor Mary J. Blige could get a feel for what type of singer he was. Once they knew that, they were able to tune in to Colton's big asset--portraying vulnerability and tenderness. Once he hit the big American Idol stage there was a tiny bit of nerves, but the character in his voice started to show, and it was finally the Colton I'd flipped for in Season 10. It's not just the skinny pants and hair, but the vulnerability and that sweet warble in his voice that reminds me of wonderful 80s singers like Nik Kershaw (video and live) and Limahl. It's not always technically perfect, no, but there's something plaintive in it that really gets you in the heart. Hence, the love. 3. Please retire "I Will Always Love You". Jennifer Hudson's beautiful tribute to Whitney Houston with her performance of this song on the Grammys should have been the final word on the subject. But no, then we had to hear it on "Glee", and now on "American Idol", and it feels like cheapening Whitney's memory rather than honoring it. This was her song because *no one* else could sing it the way she did, and it hurts to hear people keep trying. Jessica Sanchez is a fine singer, with great potential, and she took an admirable leap at this big ballad. Despite all the fanfare online and the judges' standing ovation, however, her voice is still young and a little thin and she doesn't have the maturity to pull off the emotion of this song. The final three notes were delivered exquisitely, which is to her credit, but she ain't no Whitney. She isn't even J-Hud. But I'll still be happy to see what she can do with a song next week. 4. Mary J. Blige rocks. An awesome American Idol mentor, she really gave the contestants good advice. Even better, she was able to sing that advice, which is the best way for the contestants to understand what she's looking for in terms of pitch, phrasing, cadence, vibrato and so on. She was honest, to the point, and when the singers followed her advice they did amazingly well. One of the problems that happened with many contestants, particularly the girls, was exactly the type of thing Mary warned against--pushing too hard. Everyone is in a big hurry to get to that glory note, and they end up tanking on the rest of the song--and then totally oversinging the crescendo. Hence Shannon Magrane's strangled notes. 5. New rules. Tomorrow night the judges will pick who stays from the lowest boy and girl vote-getters. Shannon and Jermaine seem most in danger, but Jeremy and Erica are possibles, never mind the shocking whims of the voting public that could eliminate a talented singer way too soon. I'm assuming the boys vs. girls format is an effort to control the early demise of anyone who isn't a cute white boy, and I'm fine with this type of damage control. (And yes, I get the irony that my favorite is a cute white boy.) Oddly, J-Lo said she wanted two girls to have a sing-off, so I'm trying to decide which one of us has misunderstood the rules. What do you think, "American Idol" fans? Who do you expect to go home tomorrow night? Were you happy to hear Deandre rein in his falsetto and his hair and give a lively, vocally rich performance? Are you cheering on little Hollie with the big voice? Who are your favorites?